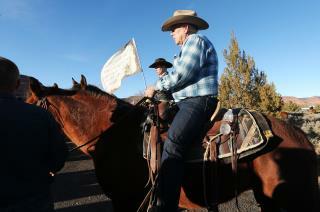 (Newser) – Nevada rancher Cliven Bundy flew into Portland, Ore., on Wednesday night to support four occupiers at a wildlife refuge—and was promptly arrested by the FBI. The Oregonian reports that the 74-year-old was booked into the Multnomah County Jail after being arrested at Portland International Airport on charges relating to a 2014 standoff at his ranch that involved grazing rights on federal land. After FBI agents surrounded the occupiers' camp, the Bundy Ranch Facebook page told America to "wake up" and announced that the Bundy patriarch was on his way to the site. Hours later, the page confirmed his arrest and lamented: "They keep coming for us patriots, they keep attacking peaceful principled men and woman [sic]." Well they were after more welfare ... jail will pay for their living costs for a while. About time. This guy should have been arrested a long time ago after the standoff. Now let's put a lien on his land to pay for the judgement against him that should come soon.